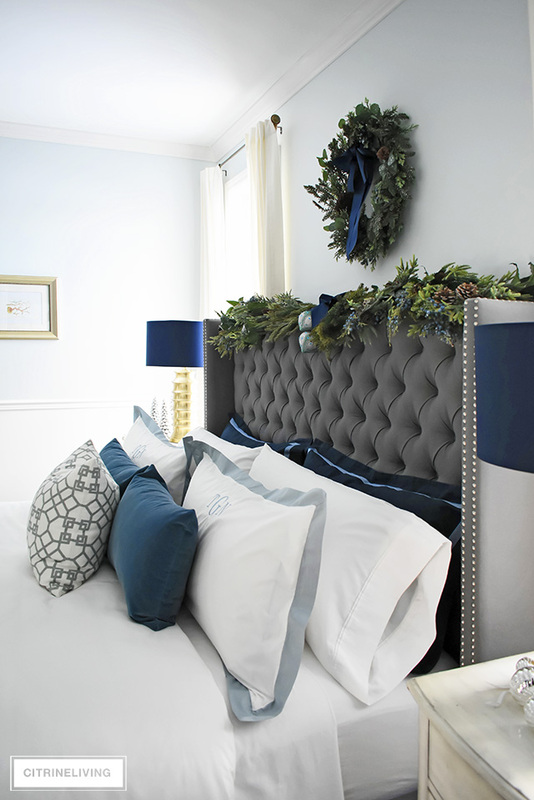 Welcome to our chic and luxurious Christmas bedroom! I’m very excited to be joining another very talented group of bloggers today for a fun and festive guest bedroom blog hop. You can click over to everyone participating below and at the bottom pf my post. 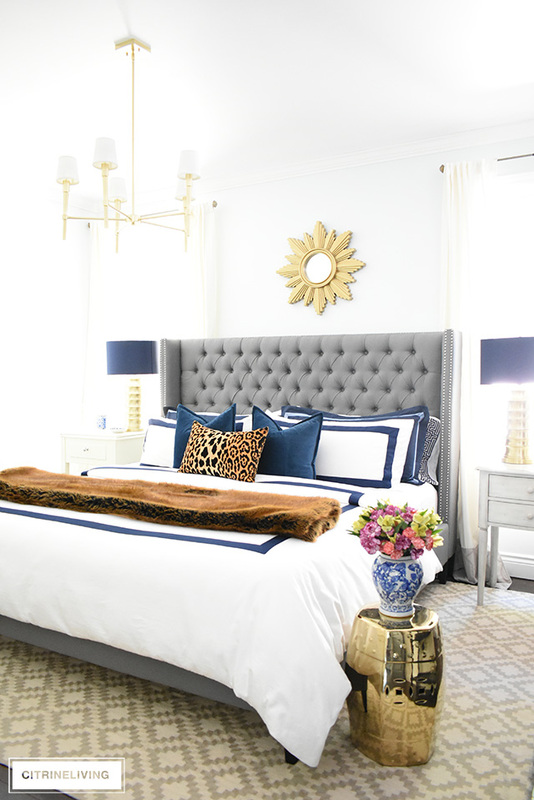 If you’re joining me today from Sue of The Zhush Blog, welcome to my bedroom, and welcome to CitrineLiving! I hope you enjoy your stay while you’re here. I love Sue’s fabulous style – it’s always so very chic and elegant! If you remember my Christmas bedroom from last year (see it here), it was full of red tartan, which of course is always a crowd favorite for the holidays, and a huge departure for me! 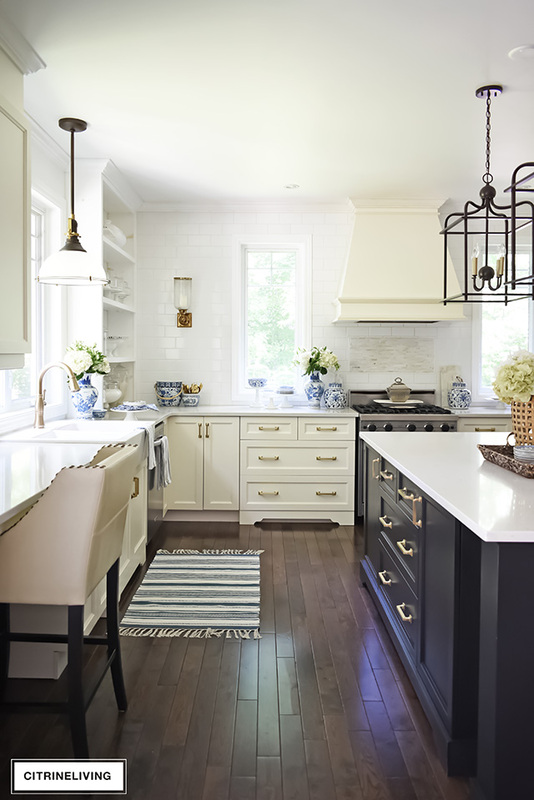 This year, I’ve decided to keep to cooler hues and play up the existing blue and white palette that I’ve had in here for a while now. 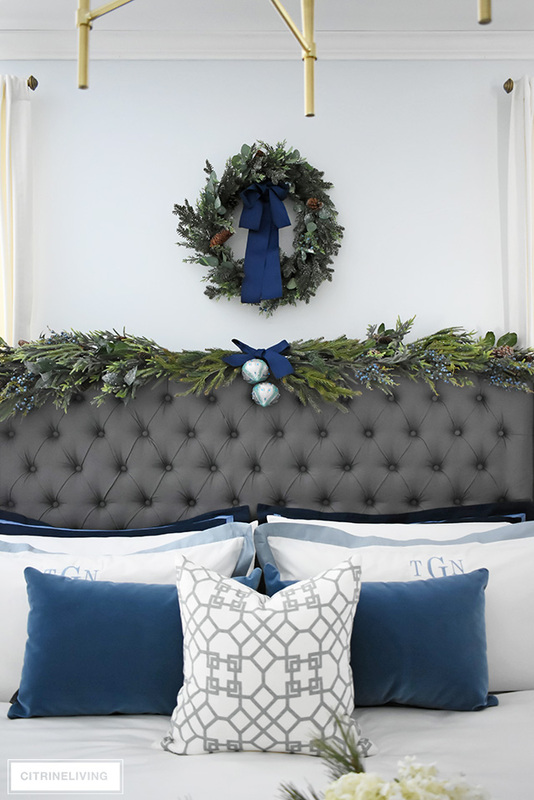 With our beautiful and luxe new bedding, along with some holiday greenery, our bedroom is guest-ready for the Christmas season. 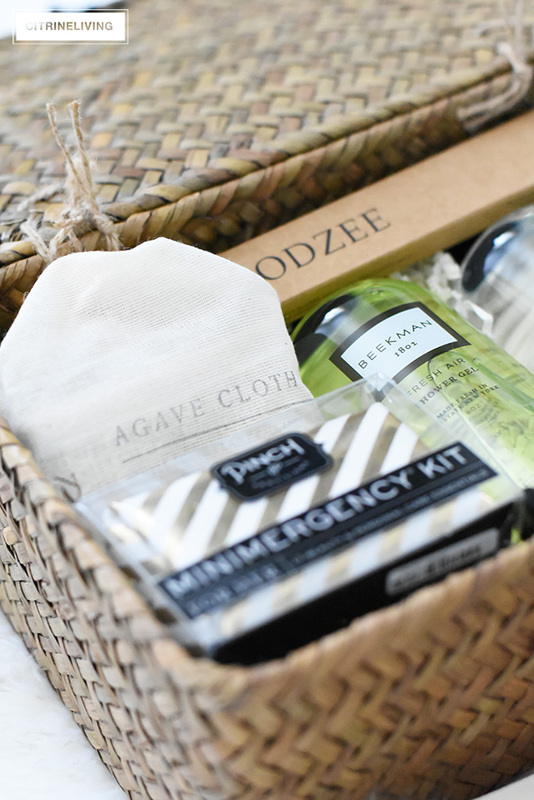 I’d like to extend a very big thank you to Crane & Canopy for providing our gorgeous new bedding and also to Panache Gift Baskets for the fabulous gift basket, perfect for any guest! Panache is offering a 15% discount on all orders, using code CITRINELIVING15 – such a fabulous treat! *Affiliate links are provided throughout, or at the bottom of this post for your shopping convenience – see my full disclosure policy here. Our home is on the smaller side, with only three bedrooms on the main level, and a sleep-sofa in the basement, so when we have guests that come to visit, I love to treat them to a relaxing stay in our master ensuite bedroom. Our guests can have the privacy they need in this space, without tripping over our kids and their things in our small, main bathroom. I don’t always decorate our bedroom each year for Christmas, it’s a tight space, and we don’t have that much extra room for a large tree. I decided this year, to bring in the season, I would do it with a few small touches that could do the trick. 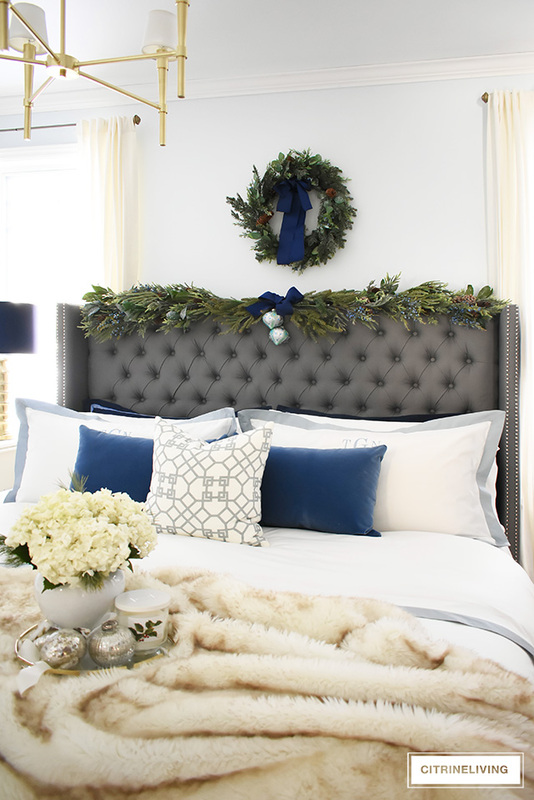 I hung a wreath in place of our sunburst mirror over our bed, and created a garland along the top of our headboard. 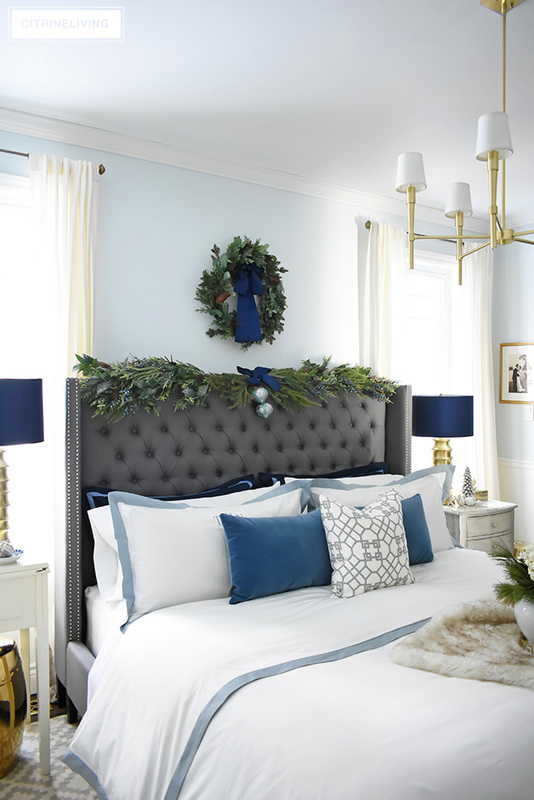 I kept it simple and used my holiday greenery from last year’s blue and gold Christmas decor in our living room (see it here), since this year, I’m sticking to mainly silvers and golds throughout the rest of our home. 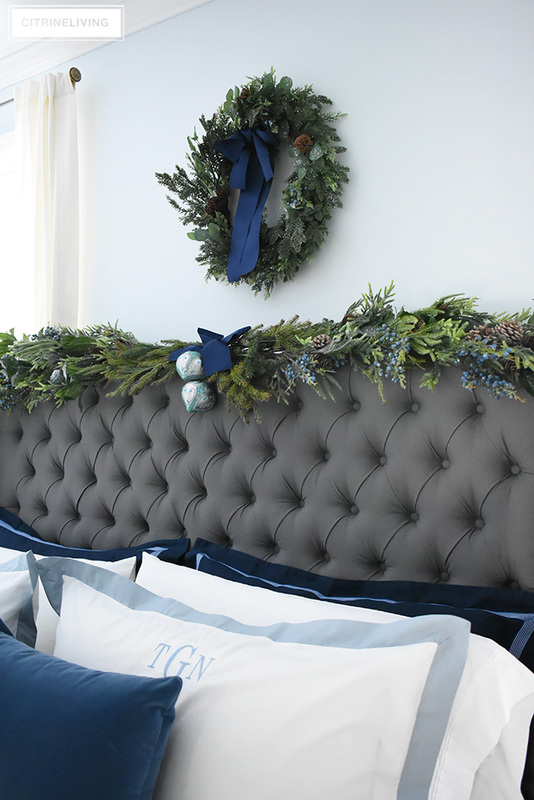 To create my garland, I used individial stems and laid them across the top if the headboard, hiding each stem under the next bunch of greenery. 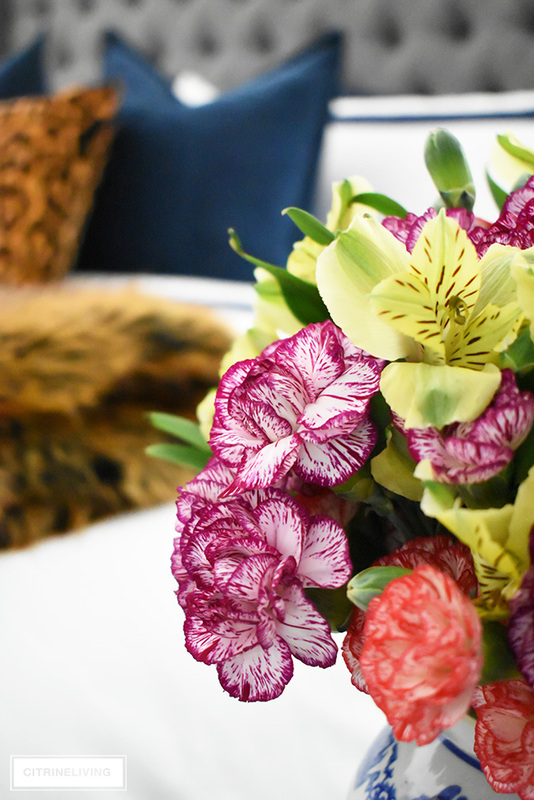 A faux fur throw and a tray with fresh florals, a scented candle and some mercury glass ornaments help to welcome our guests as they arrive. It’s always fun to greet your guests with a something special. I chose the Linden French Blue Duvet Set from Crane & Canopy, and I just love the crisp, tailored feeling it brings to our bedroom. 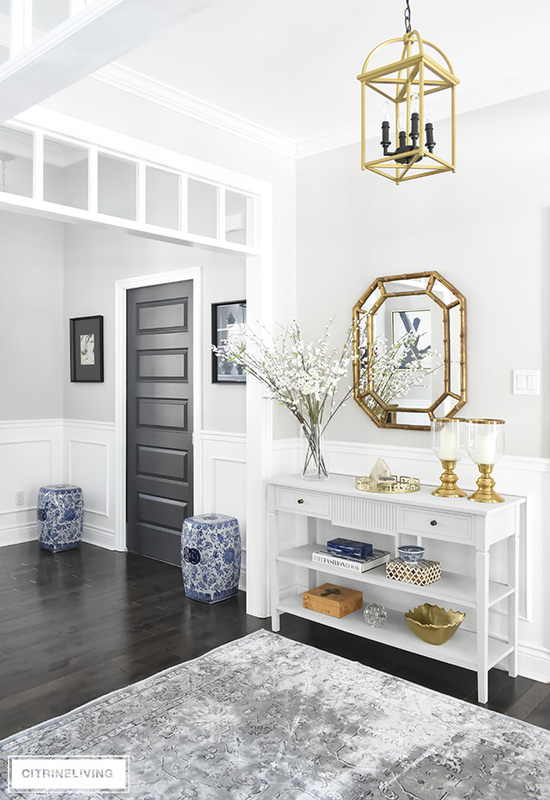 The elegant, 2″ border flange is a chic touch and I love how the soft hue of the French Blue compliments our wall color. 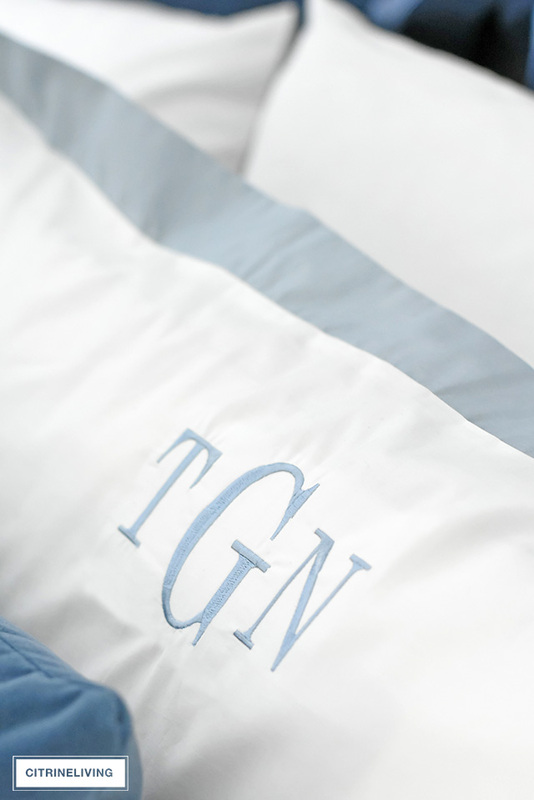 This bedding is so soft and luxurious, and I love the embroidered monogram I had added to the shams – it’s so gorgeous! Our bedroom feels inviting, classic and timeless, and I love that I can use this set for any season. I kept the throw pillows very simple, with just a touch of pattern for some visual interest, and the grey ties back into the color of our headboard. I wanted to keep this look simple and crisp with white sheets, since this is to treat our guests, it should feel like an escape – I don’t think there’s anything more luxurious than crisp white sheets! 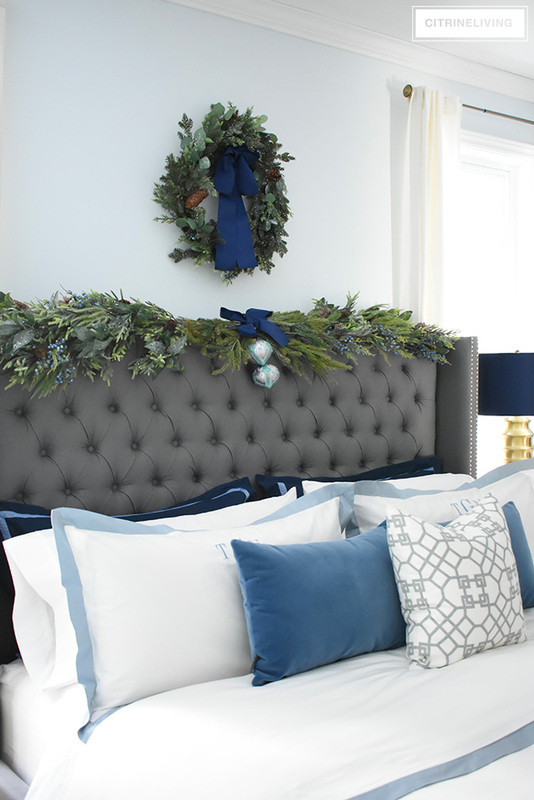 I also used my existing navy blue and light blue shams to add another luxe layer to the bed – I am all about layering those pillows! It adds fullness and creates the feeling of a fabulous retreat. 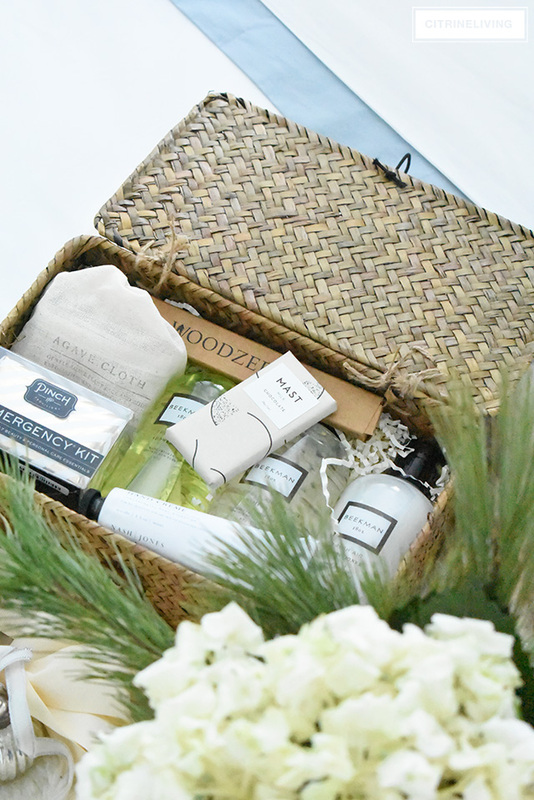 Of course, welcoming your guests with the perfect gift basket is always a luxurious treat, and this one from Panache Gift Baskets is full of so many little goodies – your company will be thanking you, I can assure you! 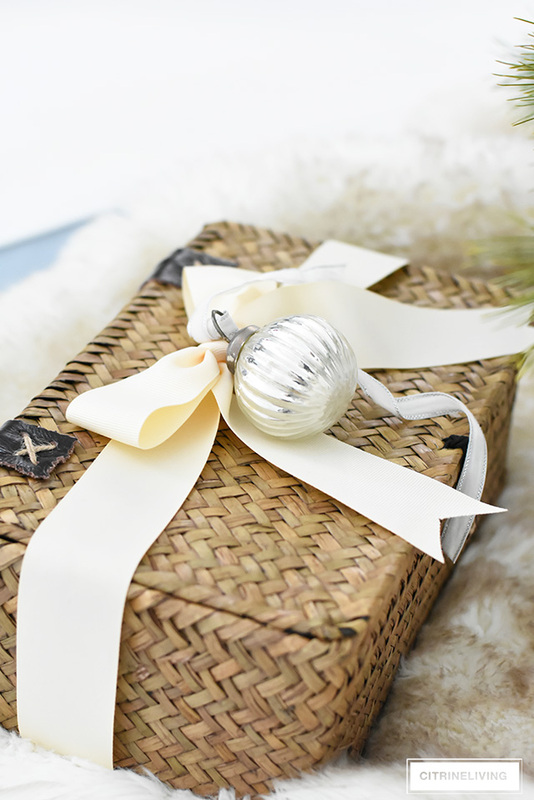 This one (click here) comes packaged in this beautiful woven seagrass box tied in a pretty bow. I added a cute little mercury glass ornament for a festive touch. There are so many different kinds of baskets to choose from, and you can even create your own custom made gift basket as well. 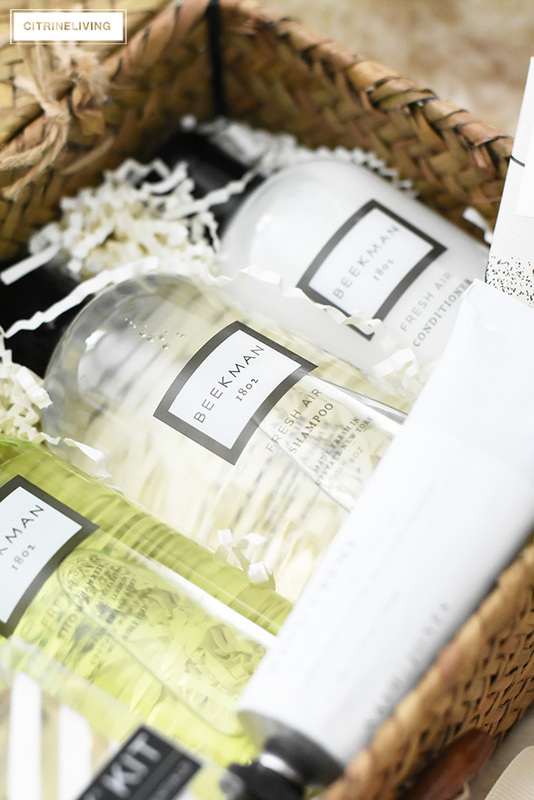 From the packaging to the gourmet treats and toiletries, the options are endless. Don’t forget you can get a 15% discount – just use code CITRINELIVING15 at checkout. I don’t know about you, but I am a sucker for beautiful packaging! You can find this gift basket here. Even though this is not a ‘true guest room’, it only takes a few simple touches for our guests to feel at home. I love to keep a stack of magazines and books, extra blankets, eye masks, earplugs and bottled water and snacks. 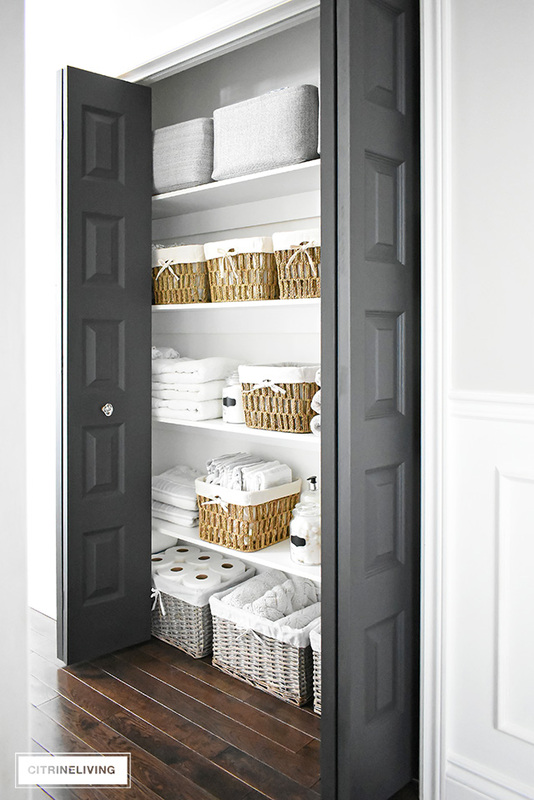 In the bathroom, extra towels, toiletries and personal hygiene products, bathrobes and cozy slippers will always surely let your guests know you’ve thought of everything for them, so they don’t have to ask you for anything. 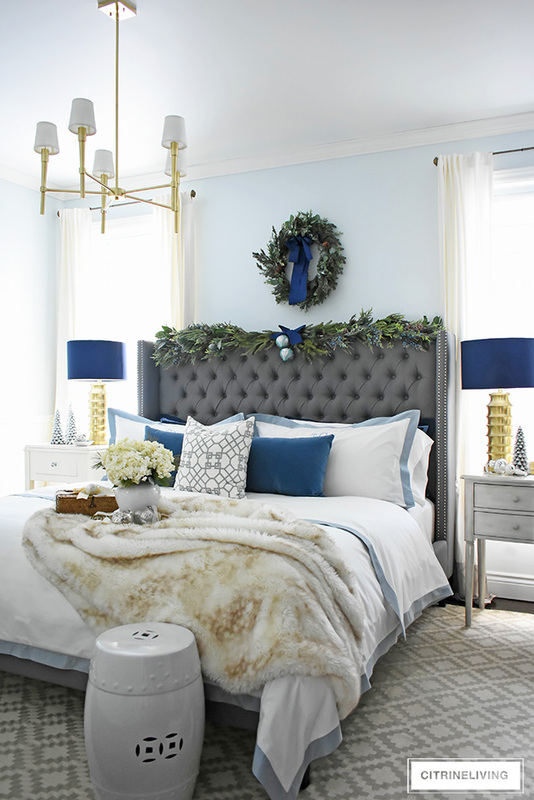 At Christmastime, a few decorative touches around the room is all you need as well. 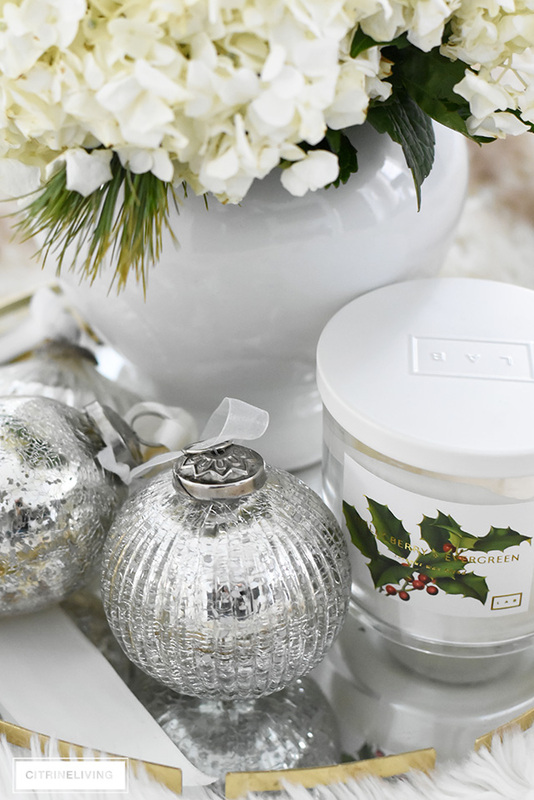 Some scattered ornaments and a seasonal scented candle is the perfect touch to welcome your guests and the festivities of the holidays. 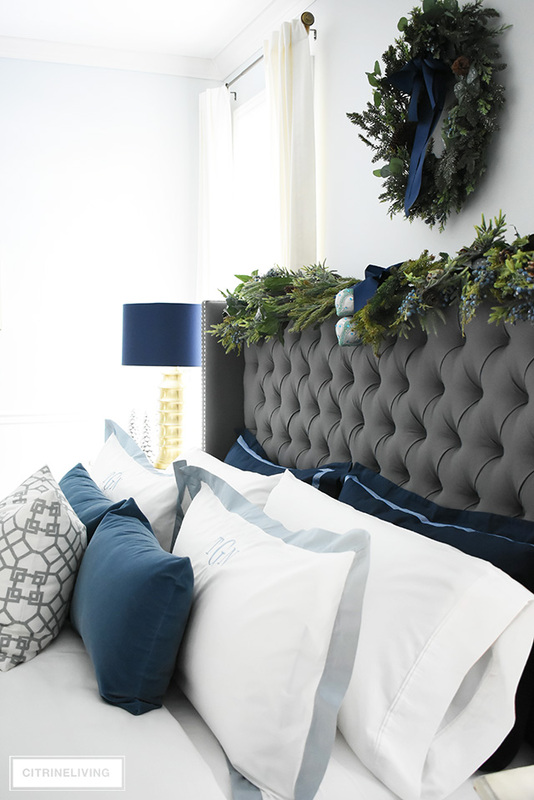 Creating a luxurious Christmas bedroom with gorgeous bedding and a thoughtful gift basket is the perfect way to let your visitors know you thought of every detail to make them feel right at home. 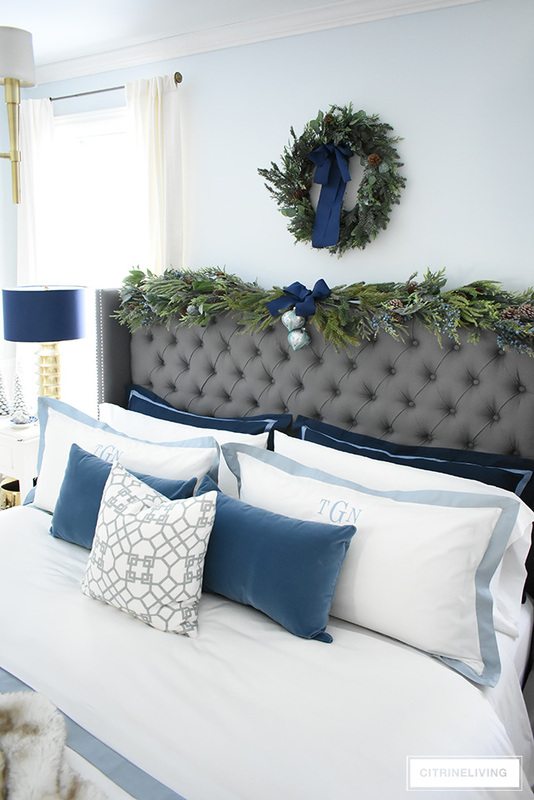 I love how you’ve paired up the crisp white bedding with the navy and gray Tamara! Beautiful job. Always looking to you for classic inspiration! Where did you get your bedroom chandelier? Hi! I have it linked right here at the bottom of my post under “Scroll and tap to Shop” – just scroll through the thumbnails and click to shop…please let me know if you need help finding it! 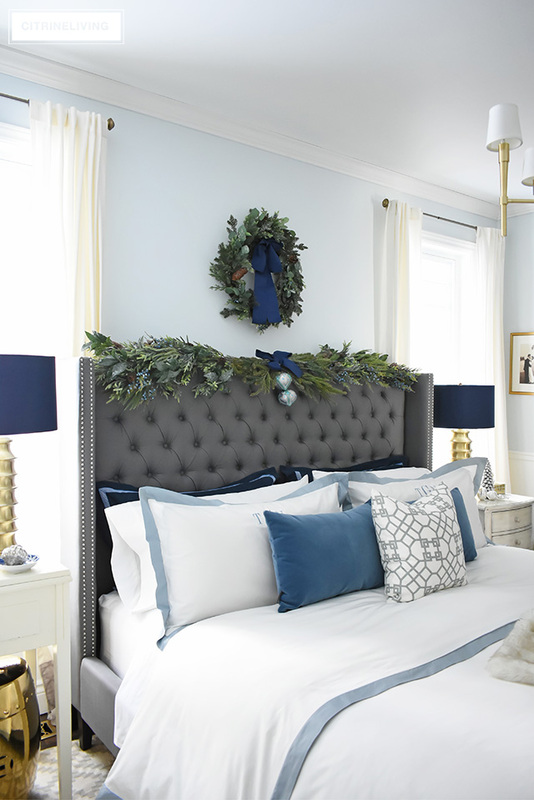 What is the paint color for your blue bedroom? Hi! 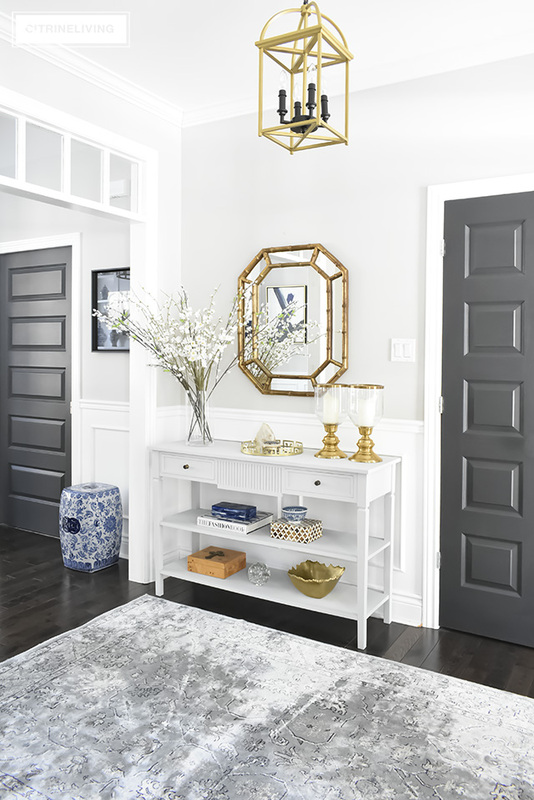 This color is discontinued, but Benjamin Moore Lily White seems to be close! I hope that helps! I absolutely love your style! Where did you purchase your bed and what color? I’ve been looking for this exact style, but unable to find good quality.